soup of the day: happy birthday, tree! and the schmutzy family by madelyn rosenberg (and a double giveaway)! What could be better than celebrating a first book by a fellow Virginia author? Why, celebrating TWO first books, of course, yes TWO — by our favorite guitar playin’, Bob Dylan-lovin’, popcorn eatin’ ace reporter turned fiction writer Madelyn Rosenberg!! And this is just as it should be — since Maddie (I can call her that cause I’m older) is twice as nice, twice as smart, and twice as cute. We are thrilled to be sending out twice the ♥love♥ today for her two debut picture books, The Schmutzy Family, illustrated by Paul Meisel (Holiday House, 2012); and Happy Birthday Tree! : A Tu B’Shevat Story illustrated by Jana Christy (Albert Whitman, 2012). I hope you’re in double the partying mood cause we’ve got lots of pictures and snacks and tasty things to say about both of Ms. Rosenberg’s new books :). We’re even revealing a little-known secret: Madelyn may be a very talented writer and all-around good person, but . . . she’s a tad messy! *ssshhh* More on that later. For now, the requisite suit up. Please put on this party shirt. To get the full effect, don’t shower beforehand. Even better, run around the block ten times and get nice and sweaty. Land sakes — roll around in the mud and load up on the schmutz! Now, select your favorite newspaper hat. Apropos not only because Madelyn is a former newspaper reporter, but because she’s also an ardent environmentalist. Reuse, reclaim, recycle . . . revise :). Okay . . . I can really SMELL you now: you’ve got the market cornered on industrial strength FARSHTUNKEN! P.U.! That’s the spirit! Eating dried fruit and nuts is often part of a Tu B’Shevat celebration. It’s observed on the 15th of the Jewish month of Shevat (January or February), and is like Arbor Day, where people celebrate trees and renew their commitment to take care of the environment. Families in Israel and other warm climates plant trees, while others may have a special Tu B’Shevat seder, where they eat foods representing Israel’s seven species mentioned in the Torah: barley, dates, figs, grapes, olives, pomegranates, and wheat. In this sweet, gentle story, Joni decides to have a Tu B’Shevat party and tries to think of a special gift for her favorite climbing tree. Would the tree like water, more sunshine? What about a giant soil cupcake or a bird in its branches? Though the tree seems happier with all of these things, it’s happiest when Joni finds just the right “friend” for it: a new little tree which they plant across the yard. Joni’s family and their neighbors all celebrate with newspaper hats (the trees wear them, too), and a promise to look after all their trees. With Jana Christy’s soft-edged illos rendered in luscious Spring colors, Happy Birthday, Tree! will help foster a love of nature and remind young readers that it’s up to each of us to care for our planet and celebrate its abundant riches. And now, roll up your jeans. It’s time for the dirty book. 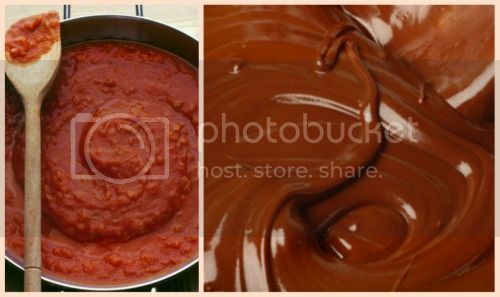 You may have been wondering what all the mud and tomato sauce are all about. Somewhat messy Madelyn has written a hilarious story about a deliciously wild and loving Jewish family, chronicling their raucous, exuberant and fabulously messy exploits during the week leading up to the Sabbath. Every day is a new adventure — swamp wading, mud pie making, tomato sauce wardrobe decorating, earthworm collecting (and eating!). Nary an eyebrow raise, a tsk or a tut from Mama, as the six children paint extra fruits on the pineapple print wallpaper, water Papa’s scalp to make his hair grow, or put makeup on the dog. These kids are allowed to full out explore, engage, create, and experiment, getting as dirty as they please and making monstrous messes wherever they go. But. Come Friday morning, Mama reminds them it’s time to CLEAN UP: “We can’t bring in the Sabbath smelling like COWS!” So, they “unstuck and unstunk and unswamped and unpainted.” They work together to make everything spit spot, help Mama braid the challah, set the table and finally sit down to a peaceful Shabbos dinner, complete with grape juice, Aunt Pearl’s Apple Cake, prayer, songs, and reflection. Saturday morning they’re off to the synagogue, possibly the shiniest, smiliest, cleanest and calmest family in the neighborhood — until Sunday, when they resume their outrageous normal routine :). Kids will especially love Mama and giggle at Paul Meisel’s charmingly detailed ink-watercolor-pencil-acrylic-pastel illos, which convey the high energy and expansiveness of the family’s lifestyle with brilliant comic touches (snake on the chandelier! blueberries all over the living room! expressions of pure bliss on everyone’s faces!). I love that while both books are about Jewish traditions, they definitely have much broader appeal with their universal themes of family dynamics, ecological stewardship, and connectedness — with our inner selves, others, and the natural world. These engaging, well-told stories will resonate with kids and easily become beloved favorites. Both Happy Birthday, Tree! and The Schmutzy Family have received glowing reviews from notoriously-hard-to-please Kirkus. Yay! Now, please help me congratulate Madelyn on her debut picture books! Despite leaving tomato stains on the counters and floor, trails of blueberries in the hallway and muddy prints on the walls, the Alphabet Soup kitchen helpers have managed to create something delicious and edible just for the occasion. They promise to clean up the mess by sundown Friday if you’ll SLURP SLURP SLURP in honor of Maddie right now! Wow, you smelly people have big appetites! It’s time to scamper over to your local indie or click through to your fave online bookseller to score your very own copies of Happy Birthday, Tree! and The Schmutzy Family. If you go to a bricks and mortar store, be sure to offer a prayer of gratitude for the trees who provided all the paper used to make the books. Wear something brown, maybe a mud pack on your face, but best to refrain from any mud-slinging in public. If you can sing a song in Hebrew, more power to you. Take a watering can in case there are any bald heads to water and bring the cashier some gummi worms. Tell him/her they smell good, and if you’re looking for a discount, don’t forget the secret word: DIRT. HAPPY TU B’SHEVAT, HAPPY SCHMUTZ, and HAPPY BOOK BIRTHDAY, DEAR MADELYN! Picture Book for ages 4-8, 24 pp. For a chance to win a signed copy of either Happy Birthday, Tree! or The Schmutzy Family, simply leave a comment at this post telling us how you’re helping to take care of the Earth (do you recycle? have you recently planted a tree? do you use reusable shopping bags?). If you help spread the word about this giveaway via your blog, FB, Twitter, etc., you’ll get extra entries (please mention in your comment). You may also enter by sending an email with “MADELYN” in the subject line to: readermail (at) jamakimrattigan (dot) com. Deadline for entries is midnight (EDT) Saturday, September 15, 2012. Open to U.S. residents only, please. Winners will be announced on this blog the last week of September and will be notified by email. Good Luck!! Two books, one about dirt, the other about a tree. When you put both in a child’s hands, magical things grow! **Chocolate Sauce Recipe via Mortimer Chocolate Co.
***I ♥ Mud t-shirt via 8 Ball.co.uk. ***Mud Smiley t-shirt via Spread Shirt. *Spreads from Happy Birthday, Tree! posted by permission of the publisher, text copyright © 2012 Madelyn Rosenberg, illustrations © 2012 Jana Christy, published by Albert Whitman. All rights reserved. **Spreads from The Schmutzy Family text copyright © 2012 Madelyn Rosenberg, illustrations © 2012 Paul Meisel, used by permission of Holiday House. Next > robot zombie frankenstein winner! Jama, I felt like I was following a pirate on a treasure hunt and this post certainly is full of treasures. THE SCHMUTZY FAMILY is my kind of book! Great photos, as always. Ahoy! Both books are special treasures. Thanks for commenting :)! I think I’ve found a new author to love. Madelyn Rosenberg’s books shout out loud with joy and celebration. I am a total recycle nut, I don’t use any products on my lawn that might go into the water table, my perennial and veggie gardens are loved by birds, butterflies, rabbits and deer. Of course, just once I wish the deer would leave some tomatoes for me. 🙂 I’m on my way over to Twitter to leave a link to this post. Have a great day, Jama and Madelyn. I envy your veggie garden! Love hearing about your green lifestyle :). Thanks for tweeting! Hooray for Madelyn! Hooray for Jama!! Thanks, Anne Marie! Hooray for you and Vampirina :). I think I would love to have these books! I only wish I had a floor littered with legs-crossed kindergartners and take them on a journey! But I am already plotting an audience should I get lucky! After just having lived for 4 years without a car, a dryer, a dishwasher and taking home my groceries in the basket of my bicycle, who would imagine that I really miss that life! Terrific to see, and they must be wonderful stories to share too. A friend told me about a family who had a trampoline & the kids were allowed to sleep out on it. She said she always wanted to be in that family. The Schmutzy family reminded me of that story. I re-cycle, use the good shopping bags (no more plastic for me), & re-use too. Am off to tweet, Jama. Thank you and Madelyn for a wonderful sharing. After reading The Schmutzy Family, I wanted to belong to their family too. Sleeping on a trampoline — wow! Like a big hammock only bouncier :). from the Silver Palette). Thanks! Hi Paul, thank you so much for your good work with the Schmutzies! Good heavens, homemade apple cake! I’ll be right over :). . . I love picture books about food and I love this post and your site. Can’t wait to read these books. Would love to win copies of one. My newest save the earth tip–drive less, walk more. Walking saves the earth and keeps you fit! Great tip. You sound like a girl after my own heart — food PBs! Yeah! Wow! Good enough to eat … and eat … and eat. Great books. Congratulations! Please help yourself to more treats. Thanks for partying with us today! Precisely — time to play, time to work, time to be loud, time to be quiet. I love the humorous telling. A “message” is there but there’s absolutely no preachiness. Madelyn is the best 🙂 Can’t think of a nicer person to have two picture books out at once! Not surprised at all to hear that they are great. That apple cake looks like it would be just the ticket, Jama. Agree with you about Madelyn. So thrilled and happy for her. Boy am I craving apple cake!! This is such good news! I can’t wait to get these books into my school library. Hooray, Madelyn, and hooray to Jama for such a lovely post! These books are perfect for all school libraries! Thanks, Natalie, and more cheers for Madelyn! Thanks so much, everyone, for the kind words and lovely welcome. And a HUGE thanks to Jama. I can’t believe how much work and love you put into every post!! After reading it, I really did find my perfect fall wardrobe: T-shirts that are dyed in Virginia red clay!! I will definitely be trying these recipes as well — perhaps tomorrow, to welcome the kids home from school. Thanks, thanks and THANKS! My pleasure, Madelyn. Thanks for writing such wonderful books for me to play with :). Wow, such a strong reaction to chocolate! (My kind of girl.) Of course the only thing that would quell those symptoms would be a huge vat of chocolate mud. Keep your mouth open when diving in :). Very informative blog with a lot of great reading. Will absolutely be coming back to read more. It seems like you spent a good amount of work into it, and it shows. Thanks!! We recycle paper, cardboard, glass, cans and plastic. I use reusable shopping bags wherever possible. We don’t let the water run while brushing our teeth or washing our hands, and we compost our organic matter.